Well, I have been working on videos (and some crafting), finished one finally, though it still isn't what I hoped it would be, and am working on another how to video, needless to say I am not happy with my first 10 attempts and will be redoing that video yet again...sigh. It is not easy to video and get all the information within 10 to 15 minutes! It is also hard to keep your images "on camera," don't even get me started on how many times I have heard myself say "mmmmm," just not good! Yes, I know, lots of things in a small space, but I am happy in the area and even though I could move into a spare room, well, I have become attached to being in my cozy corner : ) Having such a small area forces organization, and yes, it is just as easy to "lose" things in a small area as a large area : ) My area is fairly well organized, it has to be or I couldn't move. Craft storage on a budget: Loved these ideas, great way to repurpose all sorts of everyday things for your crafting storage! 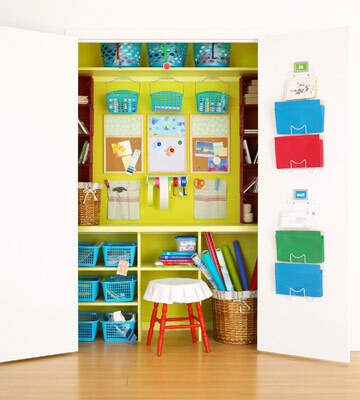 Craft closet: What great ideas here, for either a craft closet or a crafting room! 12 Craft Storage ideas: Wonderful ideas on how you can store some of your craft supplies. DIY storage projects: Again, some wonderful inspiration here and some of the ideas look fairly easy to put together. 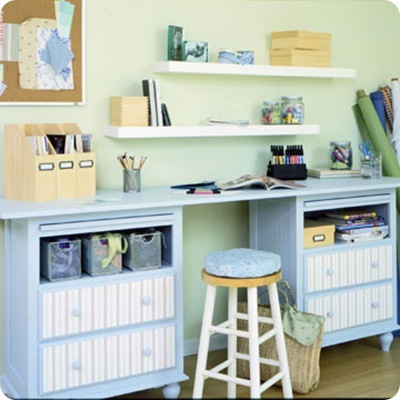 The picture shows how someone took two end tables and used them to create a crafting desk, just lovely! More DIY storage: Loved some of these ideas, very cute and easy! 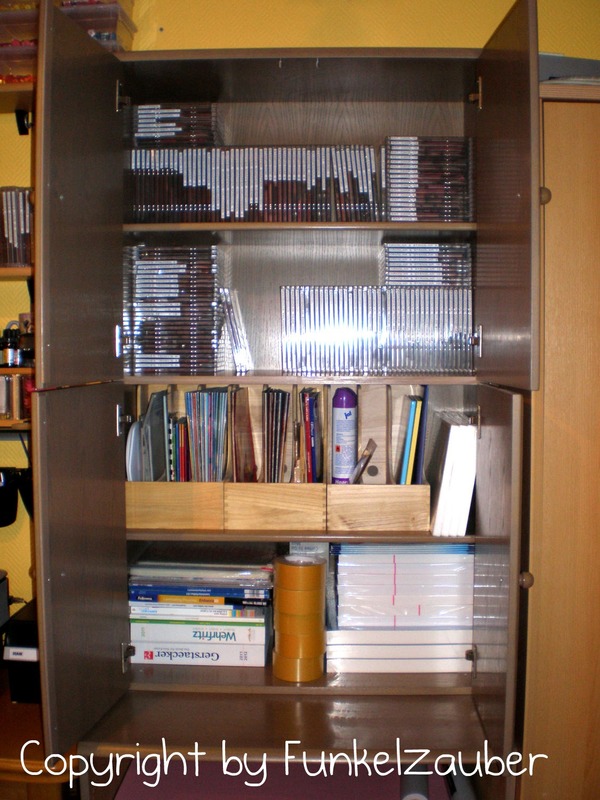 Stickles: What a great way to inexpensively store your Stickles! You could also paint this to jazz it up a bit. Craft Room Ideas and Storage: WOW! An entire board on Pinterest that has nothing but great ideas! I spent over an hour here looking at these fantastic ideas! 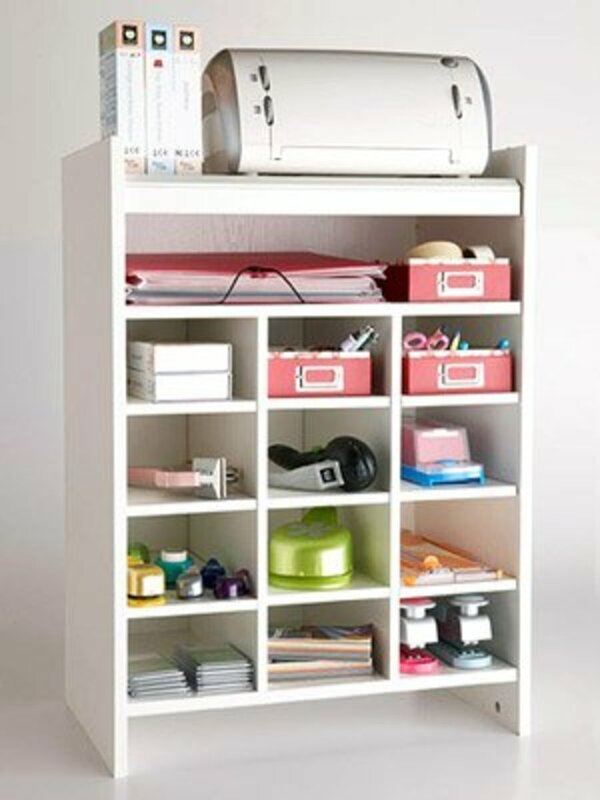 Another great repurposing storage idea: This is so cute and functional, loved it! I hope you enjoyed the post today, don't forget that I pin lots of things over at Pinterest and also try to post a link at least once a day on my Facebook page (some of the links end up here as well, but not all of them). Loved the video and all the idea Jacquie!!! 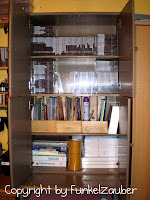 I am obsessed with looking up craft room organization so I am off to check out some of your links. Oh and I totally cracked up looking at your room at the beginning and now. It is like my house where what my hubby calls my 'craft virus' spreads through the house like crazy! !